What doesn’t say vacation more than a nice piña colada? There’s something about the combination of coconut and pineapple that really takes me away, I love that flavor. And so, why not have it as a dessert? I personally think it’s even more perfect because you’re actually eating it as a cake which is pure heaven. 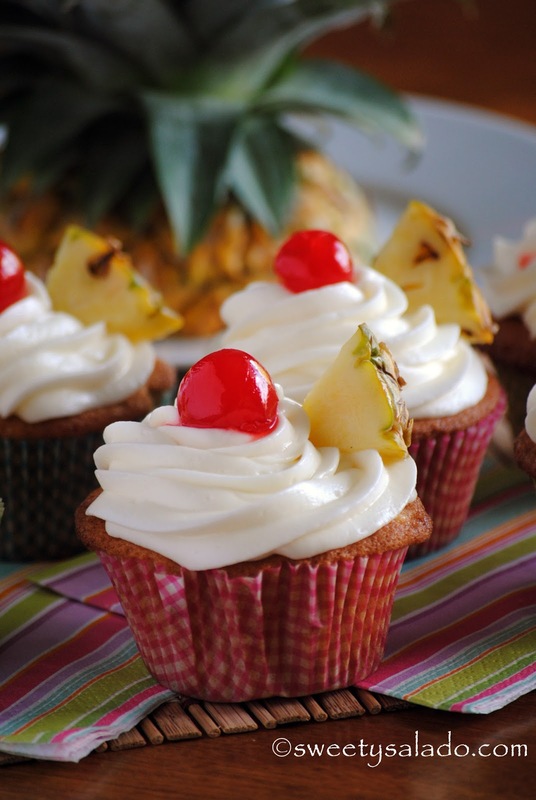 When I first started making these cupcakes I used to make the cake with pineapple flavor and the buttercream with cream of coconut, I just thought that eating them together would be enough to get that piña colada taste, but I would always eat the buttercream first and then I would eat the cake ending up with two totally different flavors. Then I went online and saw a recipe that perfectly combines the two and they came out amazing. The buttercream is what really makes these cupcakes. Mine usually turns out a little runny because I don’t like to make it with a ton of sugar, I really don’t know how people can eat buttercream that is soooo sweet, eeeck. On top of that, adding the pineapple juice and coconut cream makes it a bit liquity, so if you want it more firm, pile on the sugar. I also stopped adding rum a while back because I couldn’t taste the difference but if you really want to have it, knock yourself out. 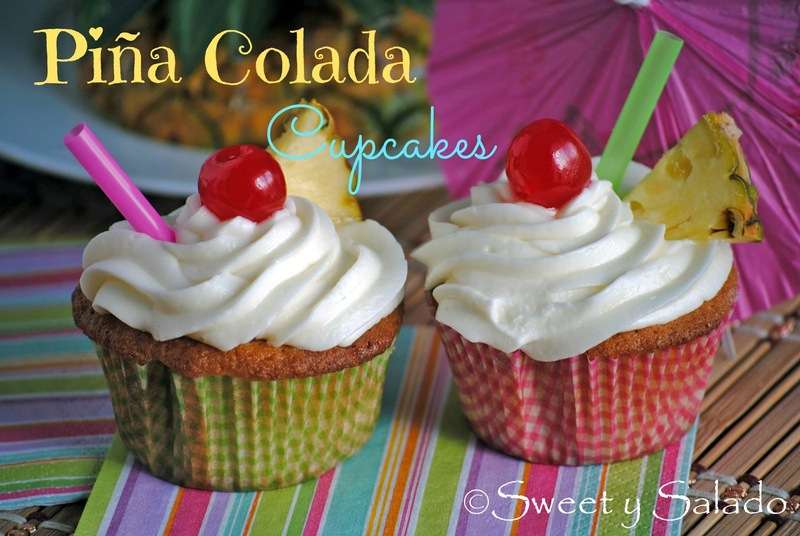 However you want to make them, these piña colada cupcakes rock! 1. In a medium bowl, whisk flour, baking powder, baking soda and salt. Set aside. 2. In a large bowl beat butter, sugar and cream of coconut until fluffy. Then, beat in eggs and vanilla until smooth. 3. Add 1/3 of the flour mix and beat until well blended. Then add ½ amount of buttermilk and mix until well blended. Repeat process ending with 1/3 of the flour mixture. Make sure to scrape the sides with a spatula to get rid of any dry lumps. 4. Line a cupcake pan with liners. Fill them about 2/3 – 3/4 of the way with the batter. Bake at 350ºF (180ºC) for about 20-25 minutes or until a knife inserted in the center comes out clean. Cool completely before frosting. 5. To make buttercream, beat butter and cream cheese until smooth, about 2-3 minutes at medium speed. 6. Add pineapple juice, cream of coconut and rum (optional). Beat again for another 2-3 minutes. 7. Add ½ amount of powdered sugar. Start mixing at low speed and increase to medium, beat for 2-3 minutes. Then, add the rest of the powdered sugar and beat until well blended. ** Add more sugar if you want your buttercream to be firmer. 8. Fill a pastry bag with the tip of your choice with the butter cream and pipe it on top of each cupcake. Garnish with pineapple and cherries. Inspired byI Sugar Coat It!. I was not very happy with the results and they dont look anything like the ones you made. Mine are very dense, like a bread like texture. I followed all directions, so i wonder what i did wrong. Hi Nella, usually when a cake or cupcakes come out dense it's mainly because the batter was mixed for too long. This overdevelops the gluten in the flour, giving you a dense cake with a bread like texture.